I was doing pretty well with the #MTBoS30 challenge, then life happened. Still, I've blogged more this May than I have in a while, so I'm counting it a success. So, let's recap. * I submitted my action research project and a powerpoint presentation summarizing my research which was my last task to do before graduating with my master's this Saturday. The husband and I will watch my seniors graduate Saturday morning, and then we're road-tripping it to Arlington, TX so I can graduate Saturday evening. Hope to share my research on the blog soon! * I finished my fourth year of teaching. The last few days were weird. Very few kids actually came to school. 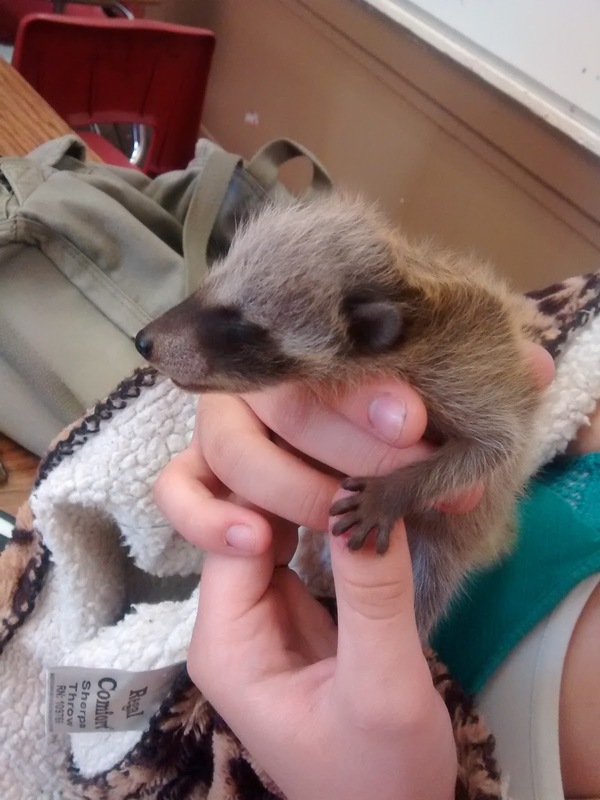 One kid brought a baby raccoon he had rescued. This is, by far, the coolest/weirdest creature I've ever had in my classroom! * I survived this year's senior prank. 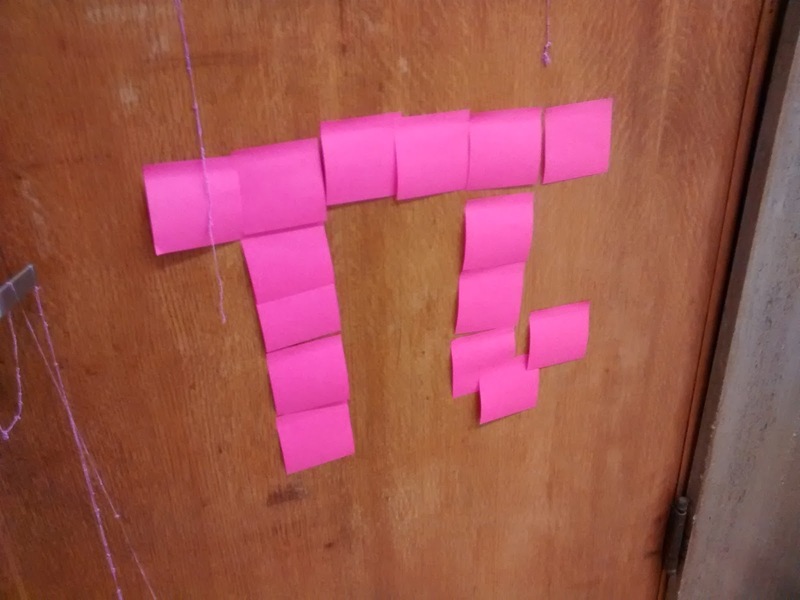 While I don't approve of trashing the school (I am such a rule-follower), I did find the door decoration they left for me amusing. 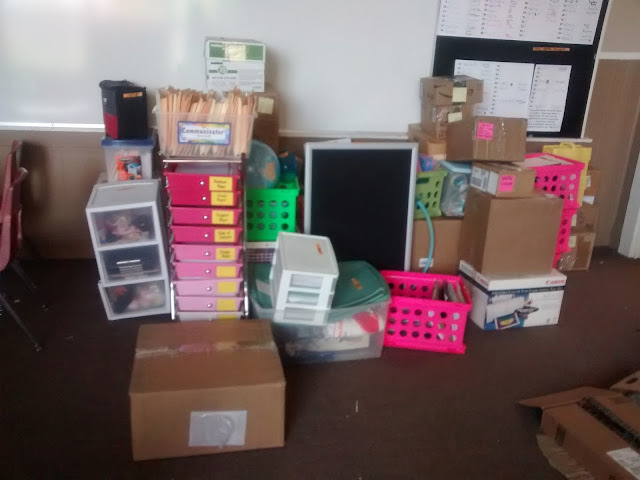 * I packed up my classroom of four years in a million boxes. My superintendent said I haven't been teaching long enough to generate this much stuff. 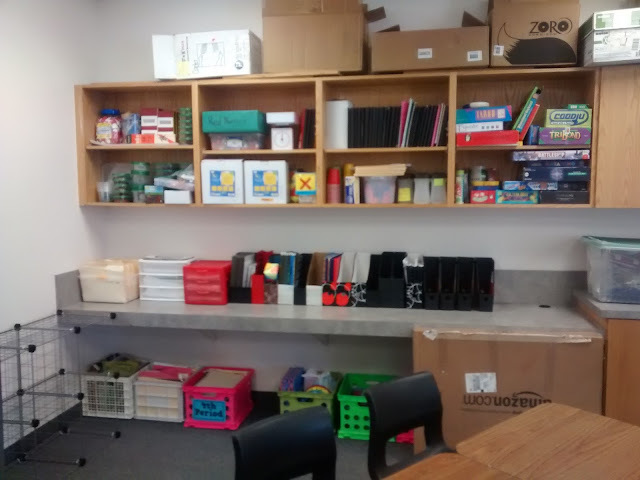 * I unpacked my boxes of classroom stuff in my new classroom. I'm still teaching high school math, and I'm still teaching in Drumright. Due to a 1.3 billion dollar shortfall in the State of Oklahoma's budget, school funding is being cut drastically for next year. Many of the surrounding districts have been forced to go to a four-day school week next year to cope. Our school board chose to consolidate our middle school and high school into a single building in lieu of going to the four-day school week. Since the middle school is approximately 6 years old and the high school is almost 100 years old, it made sense to move the high school to the middle school. 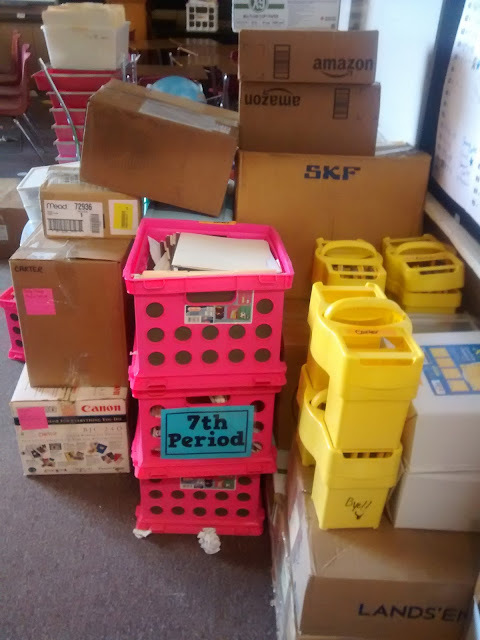 To help accomodate the high school at the middle school, we also had to move the 6th grade to the elementary school. 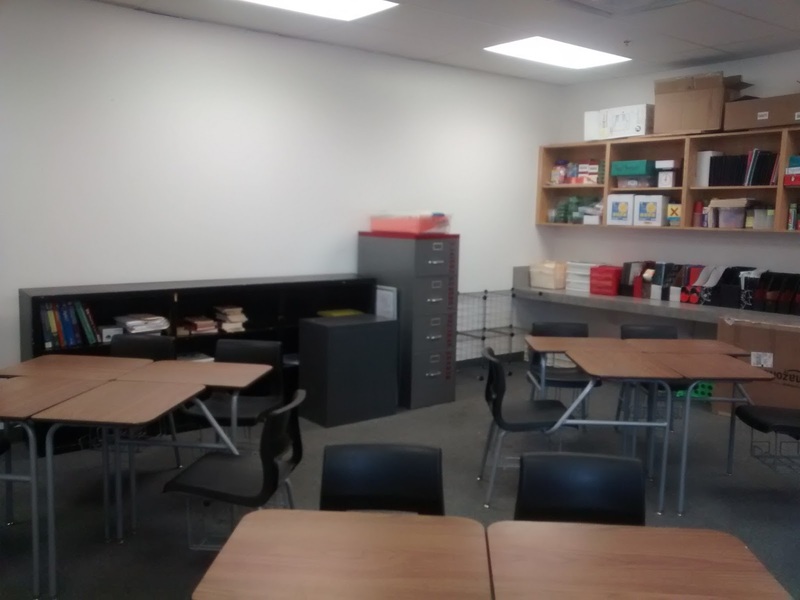 Here are pics of my new classroom. Want to know what I'm most excited about? Cabinets, cabinets, and more cabinets! My old classroom had zero storage. I had to rely on filing cabinets, a storage cabinet, and crates to store everything. I still got to bring all those things from my old room, but I have an entire wall of storage. I'm also SUPER-excited about the counter-top. It'll be perfect for organizing copies for the week! I've got a window I need to sew some curtains for this summer. First, I need to make a to-do list for this summer! I've got two doors in my classroom. One leads to the hall. It's shown above. The other door leads into the other math classroom. It's shown below. I also need to make curtains to keep students looking from one math classroom to the other. I've got a lot of decisions to make about decorating my classroom this summer. 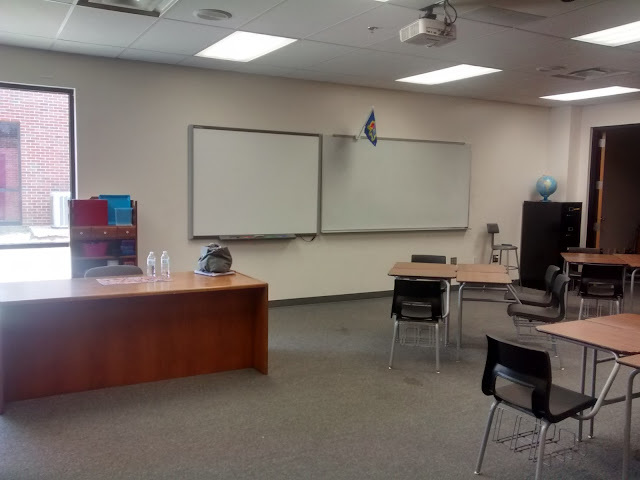 In my old classroom, I had a giant dry erase board that my parents bought me off craigslist and some bulletin boards they made me. I need to figure out which of these can be moved to my new classroom. Then, you know me. I have to make new posters and decorations for next year, too. 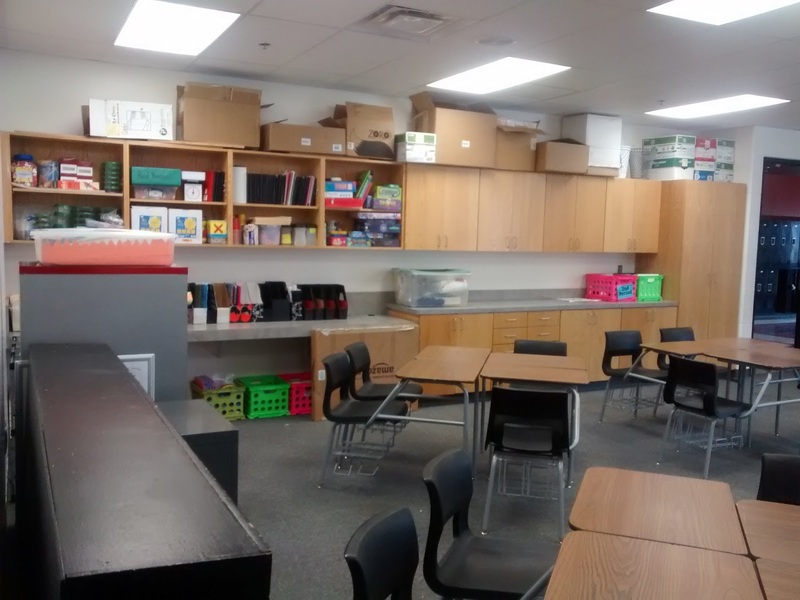 Super-looking forward to sharing finished classroom pics come August! 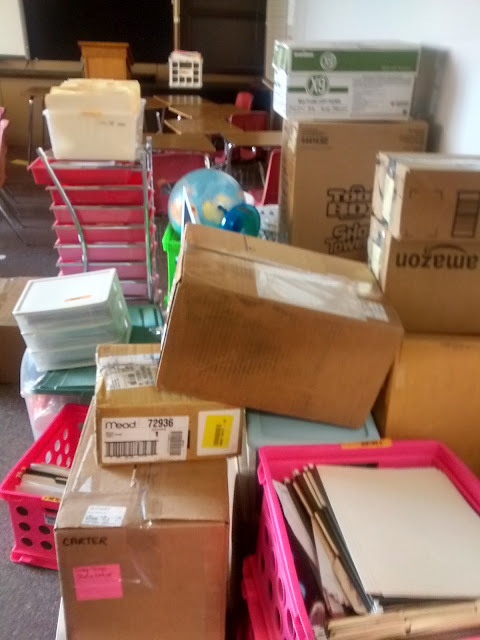 Coincidentally, I'm finishing my 4th year and have to pack to move to a new classroom too! Thanks for posting all of your stuff fully packed. It makes me feel better about my own giant pile of acquired stuff to move. That rooms looks like an upgrade from your previous room. I've started planning my BB for next year (I mean the ones I've planned for the last two years and never made ;)) I'm doing some updating in my room too, but don't know if I'll put them up before the end of the school year or wait until Aug. I cannot believe you are done with school. We have four weeks to go! It's a definite upgrade! Good luck with your plans for next year! You're almost done! Your new room looks great! I have a great addition--my student desks are painted with the white board paint. Since this is a new room, maybe you might want to do that. It is so easy to write with Expo right on the desk--for both me and them! Some students think better when writing bigger in darker colors. The only downside is the paint is pricey. It lasts the whole year, but some desks need to be repainted at the end. Have a great summer! Yikes! Sorry to hear about the budget shortfall. Things aren't great in Indiana, but they're not at that level. Definitely puts things in perspective. I hope you like your new room and school. I've had to move from one room to another within my building each of the last three years (but not this year - at least not yet!) and it was helpful in making me clean out old stuff and organize what I have. Our 6th graders are in the elementary schools, and as a parent, I really like it. My children have seemed much more ready for middle school in the 7th than in the 6th grade. I cant believe you are already done with school for the year. In Vietnam, we don't finish at my school until June 8. As for all the boxes, I know what it is like. Enjoy having windows and cabinets....THey are wonderful to use when teaching! Wow! I'm assuming you either start later than us or you have a much longer school year. We have 185 days with students. They start August 10. Teachers return August 1. Of course, then there are all the different breaks that we get during the year.....Fall Break in October, Spring Break in March, Reunification Day, King Hung Day, International Labor Day, 2 weeks Tet (Lunar New Year) in February, the list goes on. Most Vietnamese public schools go until the end of the June, so I am glad tobe at the International school I am at. 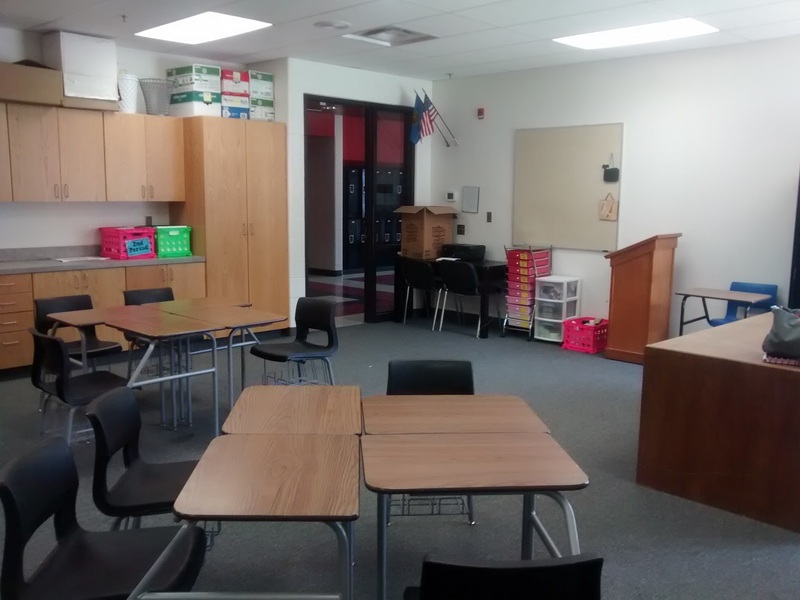 Can't wait to see what you do with the new room! I changed schools after my 3rd year and couldn't believe how much I had accumulated in that short of time. We don't have graduation for another month! Enjoy your summer and congrats on graduating. Thanks Jane! The schools around here are having to get creative to cut millions from their budgets. I'm so jealous you are finished with school - the students are here until June 10 and then teachers have two more days - 19 school days left. I'm also jealous of all the cabinet space - I can't wait to see how you set it up. Congrats on finishing your Master's! Thanks! And, I'll be jealous when you're still on summer break when we're back in the classroom. 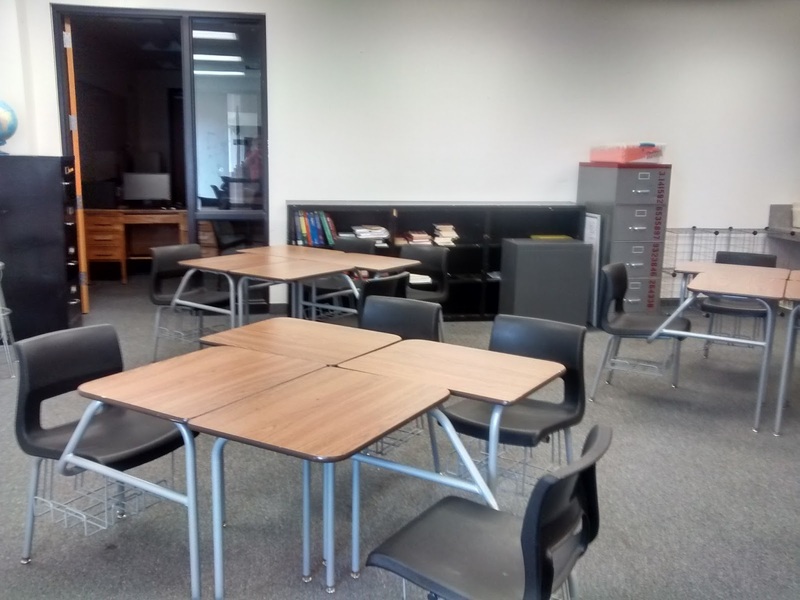 Sarah, or anybody, do you have an idea how to design lessons during which the students could walk from one classroom into the other? Maybe using that door we can see in the pictures?